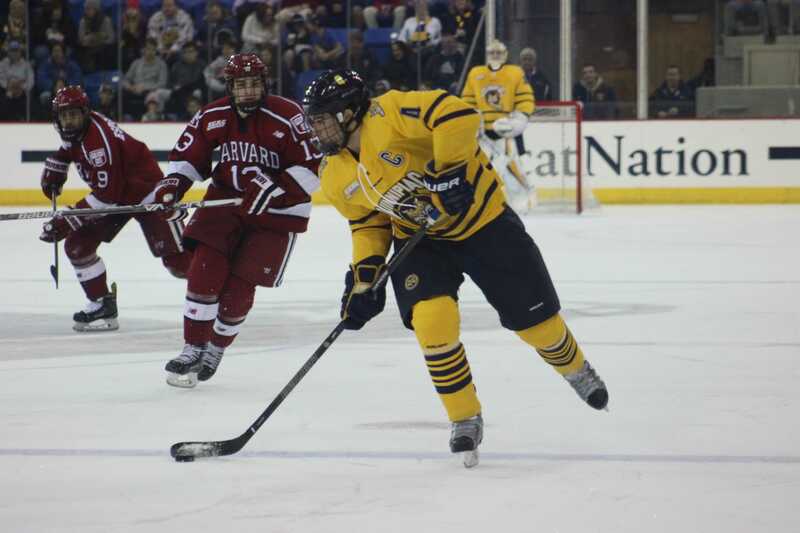 Fifth-seeded Quinnipiac men’s ice hockey team’s season came to an end on Friday night as it lost to top-seeded Harvard 4-1 in the ECAC Hockey Semifinals. The Bobcats end their season with an overall record of 23-15-2 and 13-8-1 conference record, while Harvard will play the winner of second-seeded Union and third-seeded Cornell tomorrow night. While the first period saw no score, Harvard proved to be the dominant of the two teams, showcasing its patience in the neutral zone on an elongated Olympic-sized sheet of ice. There was only one shot through the first 11 minutes of the game until Harvard defenseman Viktor Dombrovskiy gave life to the Crimson with the first scoring chance of the contest. After that, it was all Harvard in the first period. 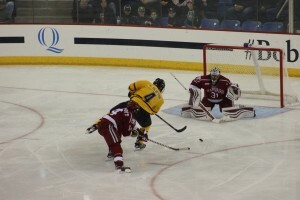 Yet, Quinnipiac freshman goaltender Andrew Shortridge stood tall, stopping all 13 shots that came his way. In the second period the floodgates opened after Crimson forward Sean Malone beat Shortridge on his blocker side at 11:00. 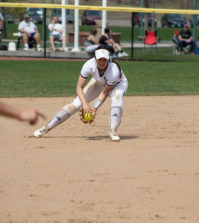 Five minutes later, it was Quinnipiac’s turn to strike back. 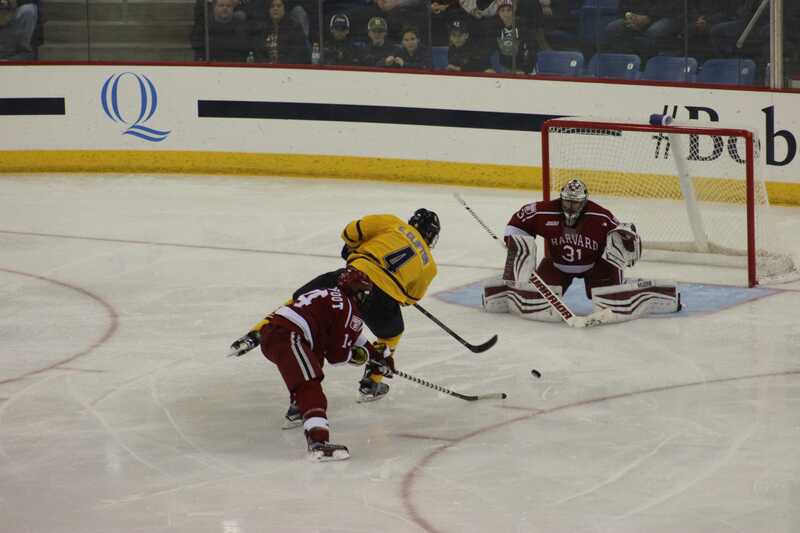 Sophomore Thomas Aldworth capitalized on the power play when he slid the puck across the crease and found a small gap in between Harvard goaltender Merrick Madsen’s right pad and the post. The goal was Aldworth’s 10th of the year and the final goal of Quinnipiac’s 2016-17 season. After senior captain Connor Clifton took a holding call late in the period, the Bobcats were on the penalty kill again. 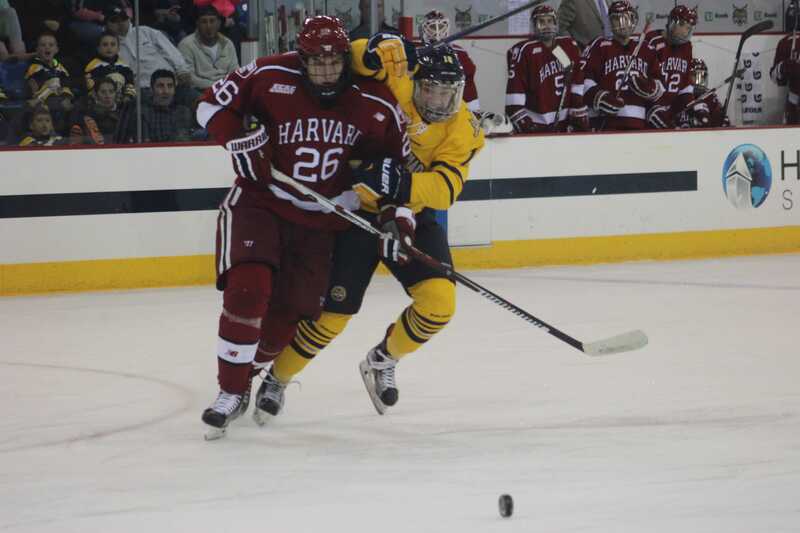 While Quinnipiac was able to stop Harvard on the power play, just seconds after Clifton stepped out of the box, Harvard forward Nathan Krusko took a shot that hit a defenseman and bounced onto the stick of Malone, who scored his second of the night. The Crimson came into this contest boasting a 19-0-0 record when leading after two periods, and went into tonight’s third hanging onto a 2-1 lead. Just over four minutes into the third period, it was Malone that struck again for his first collegiate hat trick. Crimson forward Luke Esposito found Malone wide open in front of the net, and a few nifty dangles later, the puck went off of the far post and past Shortridge. 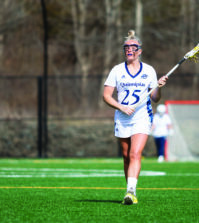 Following that tally, Quinnipiac’s desperation was apparent. The Bobcats outshot Harvard 15-8 in the third period but were unable to get another one past Madsen, who was riding a 15-game unbeaten streak entering this contest. At 17:55, Esposito buried an empty net chance from center ice to solidify a victory for Harvard and the end of the season for Quinnipiac. 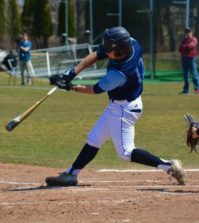 The senior class of 2017 compiled 102 wins for the Bobcats in its tenure and has already produced two NHL prospects in Devon Toews (New York Islanders organization) and Sam Anas (Minnesota Wild organization), who left early to sign professional contracts. The loss might sting for the Bobcats in the now, however, these memories will last a lifetime for graduating seniors.